The tweetstorm is here to stay, but Twitter's native interface isn't friendly towards the multi-tweet approach. I love Twitter and its 140-character limit, but sometimes I have far more to say than can fit in the space of a few sentences. For those times, I usually turn to Facebook, write a blog post, or yell at my plants. As an alternative, some employ the infamous “tweetstorm” as popularized by venture capitalist and web browser pioneer Marc Andreesen. Tweetstorms are basically multiple tweets that go together to complete a single thought and are usually numbered. Typing tweetstorms into Twitter’s web interface or your typical mobile client is a pain since you can only type out one tweet at a time. 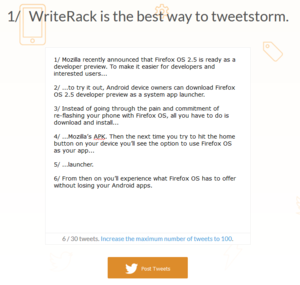 That’s why it’s handy to know about two free web apps that make tweetstorming easier. Like anything else that uses Twitter, both of these web apps require you to login with your Twitter account via OAuth. WriteRack starts off with a simple blank space for composing up to 30 tweets worth (4,200 characters) of Twitter-worthy prose. All you have to do is start typing and WriteRack will chop up your writing on the fly into tweet-sized chunks complete with numbering. If you’ve already composed your prose in a text editor or word processor you can also copy and paste it into WriteRack’s text box. At first, anything you post into WriteRack will appear as a regular chunk of text. Then if you start typing something at the end of your composition (such as a hashtag) WriteRack will chop it all up into tweet-sized bits for you. After you’re done typing or pasting your prose, you can go back and edit your work before publishing. Just hit the Post Tweets button at the bottom to see a preview, then hit the same button again to post to Twitter. WriteRack is free to use, but there’s also an optional $10 annual subscription. Premium users get several additional features such as setting a time interval between tweetstorm postings, a limit of 100 tweets instead of 30, and the ability to write and save drafts. WriteRack requires you to register an email with the service as part of its efforts to combat Twitter spam. Built by prolific developer, RSS 2.0 creator, outlining advocate, and podcasting pioneer Dave Winer, Little Pork Chop is a fantastic free web app for tweetstorming. 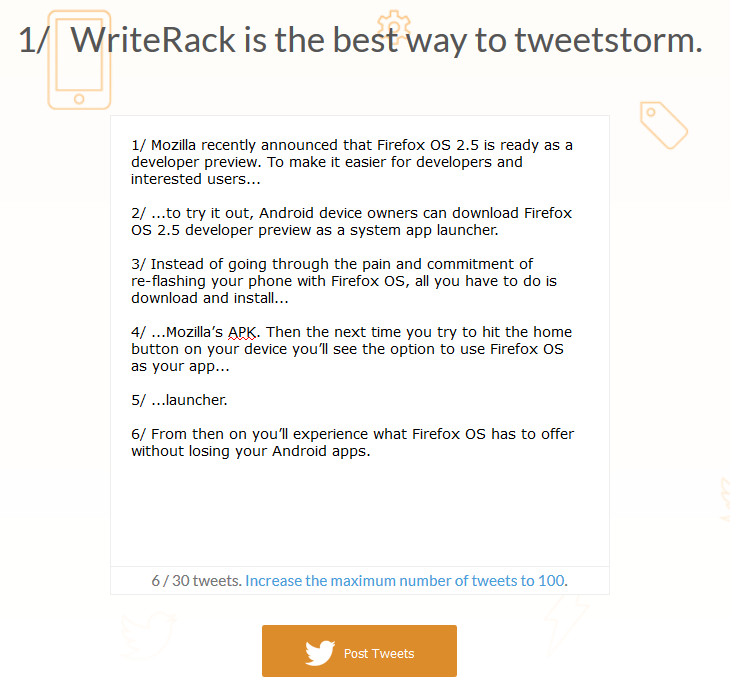 Like WriteRack, you can type out or paste your tweetstorms into the site’s text entry box. The text entry area is small to start, but you can enlarge it manually by hovering over the lower right corner with your mouse then clicking and dragging the corner. Little Pork Chop shows you a preview of your tweets on the fly in a window below the text entry area. 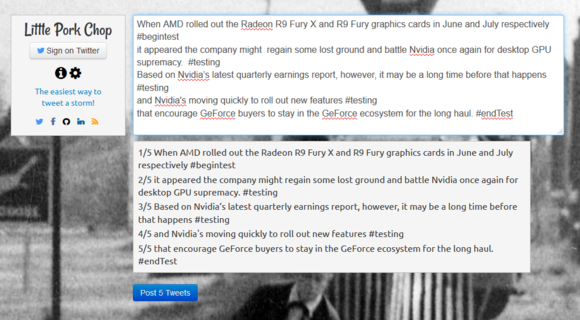 WriteRack, by comparison, chops up your tweets into bits within the text box itself. Personally, I prefer Little Pork Chop’s approach since you can type in one area and see your changes reflected in another. If you don’t like the site’s division of tweets you can easily create your own by hitting the Enter key at the point where you’d like to end a tweet. This will automatically take all the text after the line break and auto-chop it into more tweets. You can keep on breaking up your tweets for better reading flow using this method. Little Pork Chop also has a few extra features you can manage by clicking the settings cog on the left-hand side. Here you can set a specific hashtag to appear after every tweet, set a time interval between tweetstorm tweets, send your tweets in reverse chronological order, and get an RSS feed of your tweetstorm. The pain with Little Pork Chop is that it’s not a sign-up and go affair like WriteRack is. Instead, you first have to be approved by Winer by leaving a comment on this blog post on his site (Disqus registration required). He will then check you out and decide whether or not to approve you. Like WriteRack’s requirement for your email address, Winer’s whitelist approach is his way of deterring spammers from using the service. It’s not clear if Winer has set a user limit on how many people will be approved to use Little Pork Chop. Creating a tweetstorm is not always a simple thing to do, but these two free tools make it much easier.